At one time I would use a can of refrigerated/canned dough at least once a month. Let's face it; it doesn't get much easier than opening the can and spreading the dough to help make a quick meal. 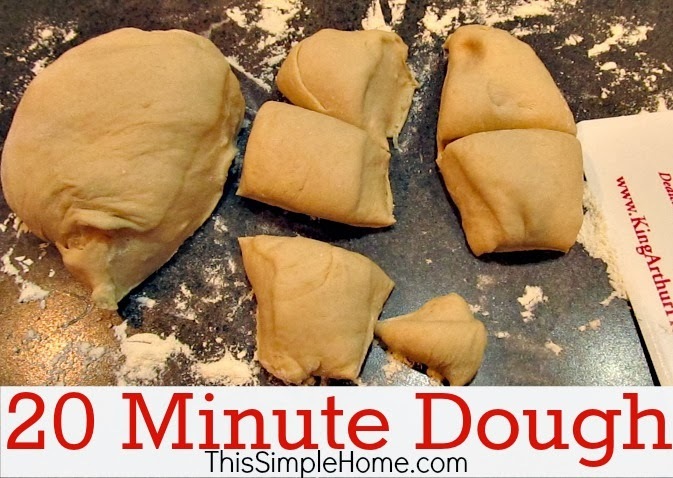 And bread of any type does take a bit of time, but this is a QUICK bread dough that is a great option when using bread dough as part of a meal. This recipe provided me with the basics for creating a quick bread dough that can be used for meals. I have never tried to make actual bread or quick yeast rolls from this recipe since I already have great recipes for those. Consider this a substitute for refrigerator pizza dough or bread dough. 1. Combine yeast, sugar, oil, and water in a large bowl. Proof the yeast if using active dry yeast. 2. Mix the salt and 2 1/2 cups flour in a different bowl. 3. Once the yeast mixture is ready (no need to proof with instant yeast), combine wet mixture with flour mixture. Add the extra 1/2 cup flour if dough is sticky. Knead (by hand or by mixer) for about 6-7 minutes. 4. Cover and let rise for about ten minutes. 5. Use in your favorite recipe. I use this in bacon cheeseburger roll-up and ham and cheese roll-ups. I've also used this to make my own ham and cheese pockets and calzones. (I intend to share the hot pocket recipe in the next week or so.) The photo above is from when I made the ham and cheese pockets. This is very similar to my pizza crust. I will have to try it for bread. I'm not very good with yeast, so I have what is probably a no-brainer question: By "proof" the yeast, do you mean let it sit until bubbly? I don't think I've ever used instant yeast. Thanks for this! Oh this is GREAT! Sometimes I don't think ahead well enough but NEED bread and end up making biscuits or something even though I really want bread! So I'll be marking this. I like the idea of making your own hot pockets. Do you have a post about that (or can you write one up) to explain how YOU do it? Thank you. I am looking forward to trying this!